Neo (Keanu Reeves), Trinity (Carrie-Anne Moss), and Morpheus (Laurence Fishburne) continue their battle against the machines in THE MATRIX RELOADED, the second chapter of Larry and Andy Wachowski's MATRIX trilogy. As RELOADED begins, Neo, Trinity, and Morpheus arrive in Zion with new crew member Link (Harold Perrineau), and discover that 250,000 dreaded sentinels are close to launching a massive attack on the underground haven for the liberated minds of humanity. When Neo seeks advice from the prophetic Oracle (the late Gloria Foster), their meeting leads to a sorely outnumbered fight with Neo's old nemesis, Agent Smith (Hugo Weaving). While the sentinels advance on Zion, various battles within the Matrix continue to escalate, culminating in an extended highway chase sequence involving Morpheus, Trinity, more imposing agents, and two new adversaries--the relentless white-clad Twins (Adrian and Neil Rayment). With RELOADED, the Wachowski brothers delve deeper into both the realm of the Matrix and the apocalyptic, machine-controlled future reality. 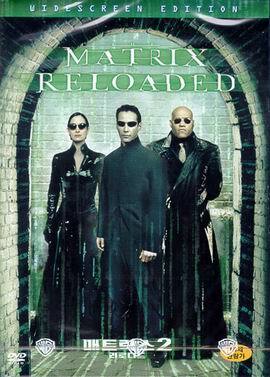 Initially giving ample attention to both the romance between Neo and Trinity and to the vast underground city of Zion, the film eventually delivers one stunning set piece after another, with the amazing martial arts sequences and jaw-dropping effects of the first MATRIX elevated to even more astounding heights. In addition to the returning cast of Reeves, Moss, Fishburne, Weaving, and Foster, Perrineau and Jada Pinkett Smith make for welcome new additions, and Monica Bellucci offers up an unforgettably sensual appearance. Larger than the original scale on every level, THE MATRIX RELOADED is a thoroughly entertaining sequel that will leave viewers eager for the trilogy's conclusion, THE MATRIX REVOLUTIONS. 4. WHAT IS THE ANIMATRIX?